Sunday February 17th 1895 It was very mild today and thawed considerable. Will and David went down to Stevens in the morning for a horse he bought of George. I was busy with the work all the forenoon. After dinner we went up and spent the afternoon with Mr & Mrs Hanke. I got supper and did the evening work. I wrote to Ida in the evening. 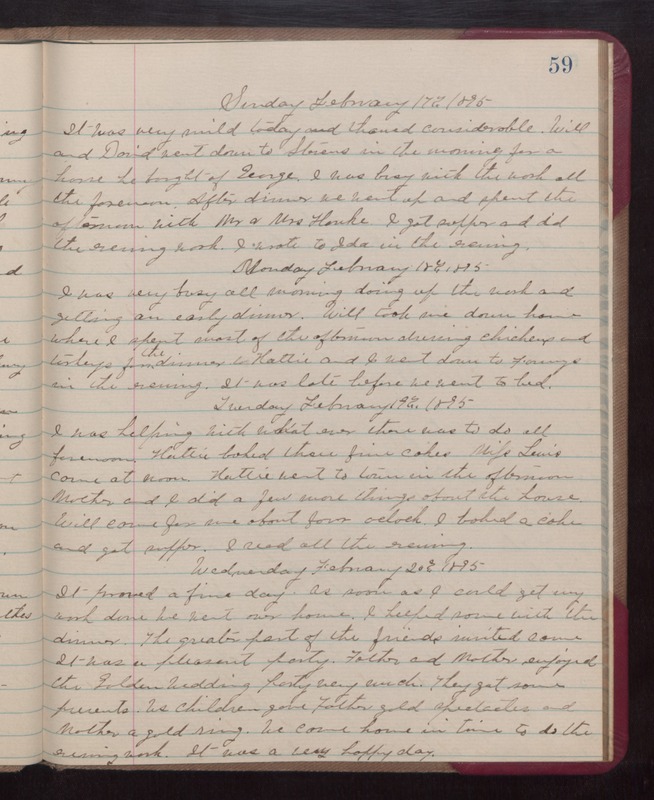 Monday February 18th 1895 I was very busy all morning doing up the work and getting an early dinner. Will took me down home where I spent most of the afternoon dressing chickens and turkeys for the dinner & Hattie and I went down to Youngs in the evening. It was late before we went to bed. Tuesday February 19th 1896 I was helping with what ever there was to do all forenoon. Hattie baked three fine cakes. Miss Lewis came at noon. Hattie went to town in the afternoon. Mother and I did a few more things about the house. Will came for me about four oclock. I baked a cake and got supper. I read all the evening. Wednesday February 20th 1895 It proved a fine day. As soon as I could get my work done We went over home. I helped some with the dinner. The greater part of the friends invited came. It was a pleasant party. Father and Mother enjoyed the Golden wedding party very much. They got some presents. Us children gave Father gold spectacles and Mother a gold ring. We came home in time to do the evening work. It was very happy day.